Khartoum, the capital of the modern state of Sudan, is located in an area of rich farmland where the Blue Nile and the White Nile meet. 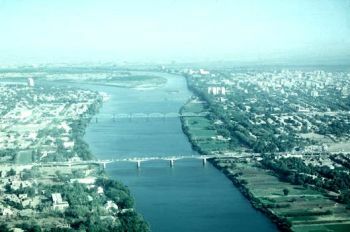 Khartoum initially grew because of the Turko-Egyptian conquest of Sudan in 1821. Mohammed Ali Pasha (1769-1849), nominally an Ottoman vassal, recognized the strategic importance of the river crossing and constructed a fort on the site. Soon, a town had sprung up around the outpost, and in 1830 it was formally recognized as the political center for Egyptian Sudan. From this locale the Egyptians managed their new possessions and enforced their will through army garrisons throughout the Sudan. The new residents, drawn from many different Sudanese ethnic groups as well as Egyptians, were given government financed building materials to ensure that the new capital would become a permanent settlement. Along with government officials, early Khartoum also hosted numerous traders as commerce prospered in and around the city. Ivory, sugar, and cotton were all traded in the markets of Khartoum. The city’s slave trade was one of Khartoum’s largest industries. From 1840 to 1860, more than 40,000 humans were sold in the city each year. In 1885, Khartoum was besieged and captured by the armies of the Mahdist Revolution. The movement was led by Muhammad Ahmad ibn Abdullah (1844-1885), self-proclaimed Mahdi, who controlled the country for the next thirteen years from Khartoum. In 1898, Anglo-Egyptian forces successfully invaded the Sudan and overthrew the Mahdist regime. One year later, Khartoum was made the seat of their new joint colonial government. In 1900, the city’s new British colonial administrators ordered a 25-year land survey in which all land claims were addressed. That same year, General H. H. Kitchener (1850-1916) redesigned the city around diagonally running streets meeting at roundabouts that could easily be defended if the city were attacked. In 1909, a new rail line provided quick access to the Red Sea via Port Sudan. From 1929-1936 under the tenure of British Governor E. G. Sarsfield-Hall (1886-1975), Khartoum began to industrialize. When Sudan gained its independence in 1956, Khartoum continued in its role as the nation’s capital. Between 1960 and 1990 Khartoum’s population grew tenfold to over one million inhabitants. This rapid urbanization resulted in housing shortages, chronic traffic congestion, and other failures of infrastructure. In recent years, this overcrowding has been exacerbated by an influx of refugees from conflict throughout the region. To this day, the outskirts of Khartoum are home to countless squatters. Bushra El Tayed Babiker, Khartoum: Past, Present and the Prospects for the Future (Durham: University of Durham, 2003); Richard A. Lobban Jr, Robert S. Kramer, and Carolyn Fluehr-Lobban, Historical Dictionary of the Sudan (Lanham, Maryland: Scarecrow Press, 2002). the Sudan (Lanham, Maryland: Scarecrow Press, 2002).